Abstract: In East Slavic, akan’e (neutralization of /o/ and /a/ after non-palatalized consonants) has spread or is spreading to dialects which maintain the mid- and low-vowel contrast (okan’e). Under the assumption that vowel neutralization is favored in durationally deprived syllables, it is expected that akan’e would first spread in weak positions, and in some transitional dialects this is exactly what happens: akan’e is found in non-immediately pretonic and post-tonic syllables. But in other dialects, the patterns of akan’e spread are unexpected: it first appears in the immediately pretonic position and before stressed high vowels and often before stressed /a/ before it occurs elsewhere. I focus on these unexpected patterns and suggest that they may emerge as a consequence of perceptual salience through contact with neighboring strong akan’e dialects in Pskov and Novgorod oblasts of Russia and in Homel’ and Minsk oblasts of Belarus. Similar patterns are found in other East Slavic dialect contact situations under similar conditions, as is to be expected. 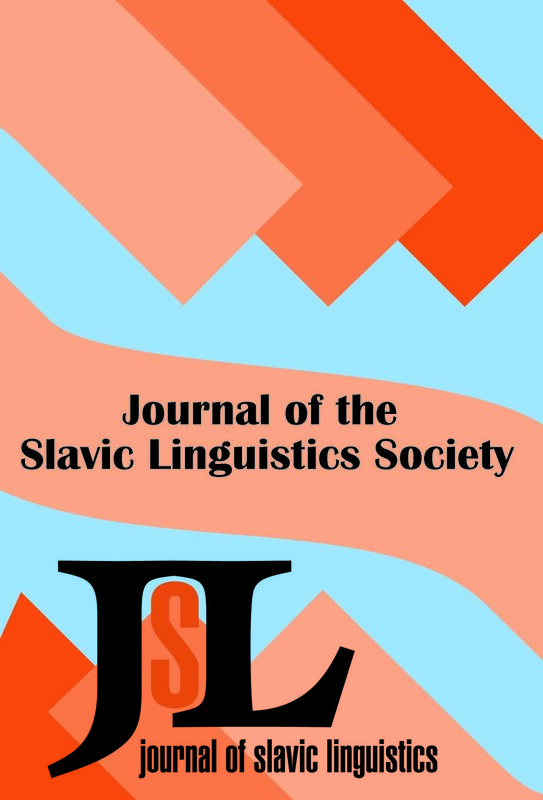 Abstract: This article provides a syntactic account of freestanding n-words in Russian. The analysis is based on the theory in Brown 1999, where Russian n-words are licensed by agreement with the sentential negation head. Under the proposed analysis, freestanding n-words are licensed by agreement with a phonologically null negative head. The article works out the details of this agreement process for both n-words licensed by sentential negation and freestanding n-words licensed by a phonologically null negative head. As a result, it provides an argument that the driving force of movement must lie in the moving element, the n-word. Abstract: This paper provides an event-structural analysis of accusative assignment in Ukrainian and Russian impersonal predicates. Constructions in which accusative occurs in the absence of an external argument, i.e., Transitive Impersonals, are found to be necessarily dyadic and causative: one argument identifies a causing or initiating event while a second argument is associated with the verb’s core meaning. The causing event is introduced by a syntactic head within the verb’s extended functional projection that is responsible for accusative valuation, but is not argument-projecting (following Pylkkänen 2008). Event structure is thereby linked directly to Case, further elucidating the role of v in accusative valuation, and providing new evidence for event decompositional approaches to syntax. Additional support for this approach is adduced from a non-cognate impersonal construction in Russian.